Keep you fresh and clean and helps to decrease daytime odor while you sleep with continuous use. Have you been using an antiperspirant or deodorant you bought at the store or pharmacy? If you are one of the large quantities of people that have, you are potentially at risk of accumulating chemicals under your arms that could impact your health. Many commercial deodorants and antiperspirants contain chemicals like aluminum, which is used to stop your sweat from escaping your pores, as well as other dangerous compounds, such as triclosan, which is used as an anti-bacterial agent. However, these compounds are potentially hazardous when placed under your arms on a daily basis. The absorption of these chemical compounds can result in hormonal imbalances that are linked to many health diseases and disorders. For those of you looking for an all-natural, risk-free alternative, Dherbs.com P.M. PitTox Deodorant is for you. Formulated without the use of aluminum, P.M. PitTox Deodorant contains natural, purifying ingredients that are activated during the nighttime to keep you fresh and ready when you get up, with a continuous use. Maintaining a daily routine that requires you to sweat is important. Exercising, using a sauna or steam room, or taking a hot bath or shower, will all force your body to perspire, open up your pores, and reclaim proper sweat gland function. As your underarms cleanse while you sweat, there is a possibility your sweat may be a little thick. Unlike other sweat glands in your body, your armpit sweat glands excrete amino acids, as opposed to just water and salt. Due to your antiperspirant, your armpits may have been unable to release these amino acids, causing the accumulation of mucus to be excreted. When you sweat and lose fluids, you must replace those fluids. Thus, staying hydrated is vital. Drinking plenty of water not only hydrates you, but also reduces the density of your sweat through the proper excretion of amino and fatty acids. As a result, bacteria are unable to penetrate your system. The clothes you wear also play a critical role. Natural fibers like cotton and hemp help move sweat away from your body and keep your comfortable. On the other hand, synthetic fibers like polyester and acetate absorb sweat within the fabric. This allows bacteria to grow on your clothing and infiltrate your body when your sweat glands are open. Choosing the right clothing can play a big role in underarm maintenance. With all that sweat, maintaining good hygiene is essential. Before your shower, use a dry-brush on your underarm skin. The hard bristles will increase circulation and loosen any toxin buildup. During your shower, use a loofah or bath mitt on your underarms to further exfoliate the skin. When you wash your underarms, stay away from ant-bacterial soaps and choose an all-natural product. Try to leave the soap on your skin for 30 seconds before washing off to give the soap time to pull away odors and remove bacteria. You can also try using alcohol throughout the day to disinfect your underarms and prevent any bacteria growth. What To Avoid After Using Dherbs.com P.M. PitTox Deodorant? Now that you have cleansed your underarms, switching to an all-natural deodorant for daily use is highly recommended. Make sure you check the ingredients label before you purchase a new deodorant as even many “natural” deodorants contain things you do not want. Wash underarms. 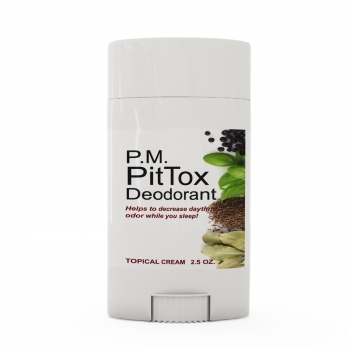 Apply a coat of the P.M. PitTox Deodorant to your underarms before bed. Wash off remnants of PitTox Deodorant in the morning. Apply a natural deodorant to your underarms for daily use. Initially a period of 30 nights is recommended, followed by a maintenance program of 2-4 times a week. Which natural deodorant is best to use with PM detox deodorant? Everyone's body is different when it comes to the use of deodorants, especially natural one's. We suggest trying out several deodorants to find which one works best for you personally. Some of the popular brands of natural deodorants are listed below. Please remember that natural deodorants usually needs to be applied more than once a day.